Would you go to 10 conferences a year? Start up a writing retreat? Hire the most expensive editor you can find? Hire 6 different editors? Buy a cover designer who charges $10,000 a book? Buy 100 brand new hardbacks every month? I’d encourage you to stop whatever you’re doing right now and make a personal list. I’m serious. You are not allowed to read any further until you do. I mean you, you sneaky reader — seriously, stop reading and write them down. This won’t work if you refuse to think a little. Take 7 and a half minutes to dream. With unlimited funds, how would you do the writing life differently? Maybe you dream of quitting your job so you have 5 hours a day to write and read rather than 1 hour a day. Maybe you dream of a live-in nanny so you can get some time to write without children. Maybe you dream of marketing your book like crazy — whole page ads in the New York Times, loads of Facebook ads, giveaways on Goodreads. Maybe you dream of joining an MFA program. Maybe you dream of having a whole room in your house devoted only to books, a gorgeous dream library filled with new hardcover releases. Whatever it is, you need to write it down so you have a list. If money was no object, you would do X, Y, and Z as a writer. If you’re stuck, here are some questions to jog your brain. What do you want most as a writer? Can it be bought? Could money help get it? What do you not have as a writer? What experiences would you like to have as a writer? What writerly possessions would you like? What would you like to build as a writer? (blog, publication, conference, writing group, retreat center, writing center for children, etc). How could money help you gain time? Okay, do you have your list? Look at it. Wonderful! Now take a breath and evaluate: which ones could you feasibly accomplish now? Now, if you said you wanted to create a massive writers’ retreat in the Bahamas, that might be beyond the scope of your financial means. But when I do this exercise with writers, they often find that much of what they dream of doing as a writer is within their financial reach. All they have to do is stretch. That library in their house? They can afford a new leather armchair or a reading lamp or a new coat of paint or a new set of bookshelves — and suddenly, reading is cozy and wonderful again. Go to more conferences? Okay, maybe you can’t afford going to 20 a year, no, not unless you become that billionaire. But maybe you’d get burnt out going to 20. 1 or 2 a year is plenty. Could you possibly reallocate some money to afford that? I mean, if writing really is important enough to you, many writers can make the finances work. If you dream of time without children, trade off kids with your neighbor for one hour a day — she takes your kids, then you take her kids. You will be astonished at how much you can write in an hour when you’re under the gun. Or write during naptime (As a stay-at-home Dad, that’s what I did for years!). If you dream of an MFA program, go to a low-residency program so you can keep your job. If you go to a full-time MFA, make sure you get a teaching position so you don’t have to pay anything out of pocket. If you want a dynamite book editor that will revolutionize your writing life, save up for it. Eat out one time less a week and funnel the savings into a fund. In six months or a year you should have enough. If you dream of going to a workshop with your favorite author, penny pinch until you can afford a flight and a seat at the table. I know sometimes it’s sticker shock at first, but if a steady savings plan can help you fulfill your dream, then it’s worth it. The truth is that for 50% of the things on the list, you can stretch your resources and live like a writing billionaire. Maybe it’s higher for some of you with a little more disposable cash — maybe it’s more like 80%! If you can’t afford something on your list, what are you willing to give up to accomplish your writing dream? Say you currently pay for cable every month so you can watch the big game. Now, there’s nothing wrong with that. But if you choose to pay for that, and not to pay to go to a writing workshop, then you are prioritizing football/basketball/baseball viewership over your writing life. Is that an accurate portrayal of your values in life? If it is, wonderful. Stick with it. If it’s not, change it. My point is that you shouldn’t let money get in the way of improving your writing. Some writers tell themselves this excuse. They hold themselves back because they believe — they honestly believe — that they don’t have the financial resources or time to become a writer. History is littered with the stories of writers — often the greatest of writers — writing from prison, writing in hovels, writing while hungry. Destitute writers can be world famous writers. And for many writers around the world, they have a decent amount of funds, but choose to allocate it in ways that don’t reflect their priorities. If writing really is as important to you as you say it is, then make sure your budget reflects that. Devote money to buying books, to taking online courses, to going to writing retreats. Here’s your takeaway from this post: Act like a billionaire writer. Act like you have all the money in the world to devote to your writing. And you will discover that if you allocate it properly, you have much more than you dreamed of, and that you didn’t need nearly as much as you thought, and that you’ve been making excuses to yourself all along. Lastly, if you’re willing, please mention in the comments a few items from your list. 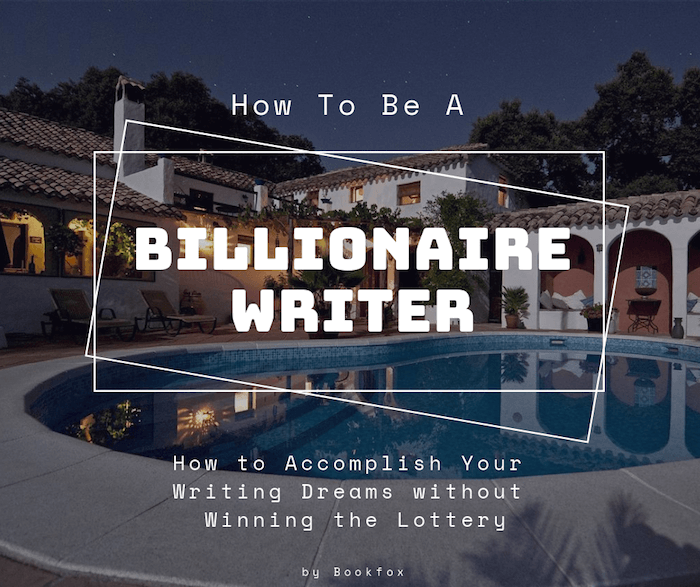 The Bookfox community would love to hear what you dream about getting as a billionaire writer. Go forth and be billionaire writers! Fantastic article. A few years ago I went through a similar process, made my list and gave up a nearly twenty-year career working around the world in finance to become a travel writer. My first book was published last year and my second is currently with my editor. Kudos to your advice in this article and all those who take it! Hey Nancy! I’m in the process of a transition that looks similar, having recently quit my jobs to focus solely on (mostly travel) writing. As I struggle to get my footing over this first year, it’s hugely helpful to hear from folks who have big successes to point to. Have you posted at all about what your transition was like and how you stuck with it to make it happen? Here are two things from my list. I am a stay home mom, so this article rang true! I’m going to blog about it and point back to it for others to read. Was a fun practice with good ideas. Plus, I love lists. 1. Explore some new places, talk to new people, expand my network. I love to meet creative people of all passions, it would be so amazing to have the time to cultivate and grow a network I could plug into. 2. Silence. Can I buy that? I would have a soundproof room with big windows overlooking something cool like a forest or city or lake or ocean. Anything that wasn’t a parking lot or next to a chicken farm would do. I love the notion of buying silence! Silence and a beautiful view — wonderful ideas. Years ago, when I was a kidlet, my neighbor was an author. Her office was in the attic and she had the entire attic covered in gray carpet–floor, walls, ceiling–and her desk was in the middle of the long narrow room facing the gray wall. I asked why she didn’t put it down by the window and she said when she wrote, she didn’t want the distraction of looking out the window. If she had a lovely pastoral view, she would be looking at it, and not working. When I began writing, I did not cover my office in carpet, but my desk now faces a wall, not the window. She was right, I’d end up staring out the window. Oh, and I painted my office mauve. What do you want most as a writer? To tell stories! What experiences would you like to have as a writer? Travel. The create-anywhere lifestyle. What’s realistic: I could budget for 1/month and/or try harder to find some quality groups that don’t charge. What’s realistic: If I’m reading more, I can read more about this stuff! And I can utilize simple tools to max productivity. What’s realistic: I can do this without much money, utilizing online resources, thrift stores, stuff I already have, etc. – Gorgeous dream library of all the books I want to read! Unlimited local bookstore purchases! What’s realistic: I can start by reading the books I have. Then maybe I can budget for a book or two per month from Skylight Books. That’s a fantastic list! And you’re in my old neck of the woods — for many years I lived in Silverlake and always visited Skylight Books. For me, writer’s block is a myth. Cultivated by the pouting, sighing and “affected” writing bourgeoisie. It only occurs when the writer has nothing to say. All the rest is pretentiousness. The moaners and groaners are just making excuses for their lack of organization, and personal weakness. If you want to write – write! You dummies!!! You know, sometimes writer’s block is a result of turning a project in the wrong direction. Sometimes you just have to figure out what’s not working. Recently, I decided to pursue my dream to write. This was all thanks to the encouragement of my husband. If we could afford it, I would quit my job to write full time. The only thing more important than my dream is the love of my life. We need both of our paychecks right now to support each other. We’re both working hard to pay off debt and increase our income so that I can pursue my dream more actively. Until then, I use all of my free time to read and improve my writing. It’s tough working up to 60 hours a week while working on an entirely different goal. 1.I would hire a personal editor – someone to get familiar with my personal strengths and weaknesses, so that I can improve. 2.I would go to at least two writing conventions a year. 3.I would vlog and blog regularly. I wouldn’t be financially strapped, so I would have time to concentrate on marketing myself and my writing.